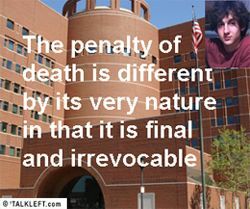 Dzhokhar Tsarnaev's jury trial will remain in Boston. The judge denied a change of venue yesterday. He did grant a two month continuance, until January, 2015. The 10 page order is here. I recommend reading the defense expert's report. It is very well written and really gives a sense of the factors that need to be considered. It is available here.